The Gurn has received the following information from Sherry Williamson of Canton, Michigan. 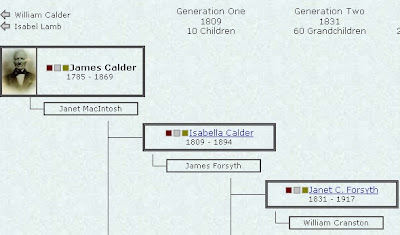 The links she has provided to Calder and Nairnshire family trees look as though they are full of interesting information. This observer has never come across the site "tribal pages" before and it appears to be a massive geneological database. You can look at quite a lot of information but on clicking on some tabs you will be asked to contact "the administrator" and register. Still what is publicy available may be of interest to some Gurnites. "I am not from Nairn, my 4th grand was - James Calder b. 1785 Nairn. James emigrated to Ontario, Canada in 1832. My James married Janet McIntosh in 1807 Nairn, all their children were born there through Alexandrina Gordon Mackintosh Calder in 1828 Nairn. I am stuck with Janet McIntosh's ancestry (McIntosh is not an easy name as there were so many). As a result, have downloaded numerous images from scotlandspeople, visited burial grounds in the area, etc. As this extra info was going to waste on my hard drive and I had some time on my hands, in July of this year decided to start a regional tree that more or less includes an area within an 11 mile radius of Nairn. If you think any of your followers would be intersted in contributing their histories, they are more than welcome. It would be nice to have folks who live in the area contributing. Kind regards and Happy New Year! !